Two men have been arrested after a man was stabbed in the neck in the early hours of this morning. 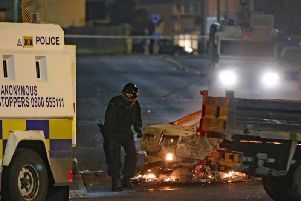 The incident happened at residential premises at the St Jude’s Parade area of Belfast. Detective Sergeant McPhillips said: “Shortly after 1.20am, it was reported that a man in his 40s received a stab wound to the right hand side of his neck. Colleagues from Northern Ireland Ambulance Service attended the scene. The male was taken to hospital for treatment for his injuries that were not believed to be life threatening. "Two men aged 33 years old and 27 years old have been arrested on suspicion of attempted murder. Both men are currently assisting police with their enquiries." He appealed for anyone with information to contact them on 101 quoting reference number 63 28/8/18.